Use the costume kit to create your own Minnie Mouse costume! This fun kit is an officially licensed Disney product that is sure to transform you into your favorite mouse. 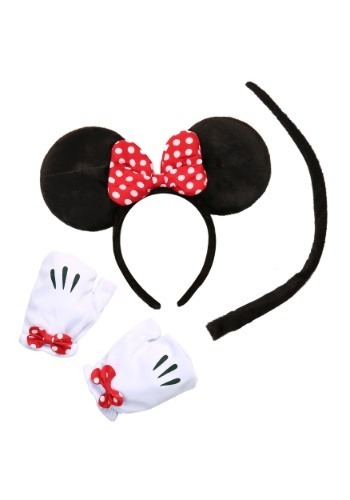 This set includes plush mouse ears on a headband with a red polka dot bow on top. The finger-less gloves are white and have a slot for the thumb and a large slot for all four fingers to fit through. On top of the gloves are three black marks just like a cartoon glove as well as a red polka dot bow. The plush black tail is approximately a foot and a half long and ends in a Velcro hoop that can be fastened around a belt loop. Be sure to check out our Minnie and Mickey costumes and accessories!